← Depression is out to get me. 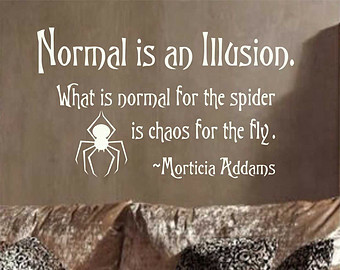 Morticia Adams said it right when she said “Normal is an illusion. What is normal for the spider is chaos for the fly”. You cannot look at someone and say they do not conform to the normal standard of a mental illness. Because , do you want to know a secret? Normal does not exist, even in mental illness. No cookie cutter, cutting out perfectly shaped bipolar copies of each other. No mold to shape out perfect play doh depressive shapes that all look the same. No stamp coming down and stamping out borderline personalities for everyone. We are not slowly going by on some conveyor belt, shape after perfect shape like a line of perfectly sculpted copies of each other. We are all different. Sure I have bipolar disorder, and maybe you do too, but we are different. We are not mirror images of each other, facing each other in some mirrored time warp where we do everything the same, just on opposite sides. When I am depressed you are manic, when I am manic you are depressed. No, this too is an illusion. We are each a part of a world where normal does not exist. Morticia said it completely right in saying that it is just an illusion. Some made up magical concept in our minds. Nothing is normal. Everything is the way it is meant to be, whether it is perceived as normal or unusual. We are all different. Each and every person ever diagnosed with a mental illness are different from each other. No two are alike. We have different patterns, different issues we must deal with and different abilities. We lie somewhere on a spectrum of the illness we have been diagnosed with. Some things the same, some things different. We range in severity, we range in symptoms, we range in color, shape, size, we are all different. And you want to know another secret? This is okay. It is okay to be different, it is okay if you are not a text book example of the mental illness you have been diagnosed with. Because normal……It is just an illusion. This entry was posted in Mental Health and tagged #stopthestigma, Addiction, Anxiety, Bipolar, Bipolar Disorder, Borderline Personality Disorder, BPD, Depression, Diagnosed, Different, Mania, Mental Health, Mental Illness, Normal, OCD. Bookmark the permalink. 9 Responses to Normal is an Illusion. Our Psych Professors would eat us raw if we ever said during a Case Presentation that “the patient was discharged in a normal condition.” They’d tell us that we should not want to get into a “What is normal?” discussion during our exam viva…. Thank you. None of us are the same, sure we may have some similarities but we are not copies of each other, and often times the public or medical communities forget that.